Thanks to the massive success of Around the World in 80 Days (1956), Hollywood started cranking out epic, big-budgeted movies populated by a slew of movie star cameos. It was an attempt to get people away from their television screens and back into the movie theaters. Chief among them was It’s A Mad, Mad, Mad, Mad World (1963), Stanley Kramer’s ambitious celebration of slapstick and farce, “the comedy to end all comedies,” as he famously boasted. It was an impressive undertaking, one that featured a star-studded cast of comic legends from vaudeville, radio, T.V. and cinema all trying to outdo each other. When a gangster (Jimmy Durante) crashes his car out in the California desert, several bystanders (Berle, Hackett, Rooney, Caesar, Winters) stop and help him out. With his last dying breaths he tells them about $350,000 in loot squirreled away in a state park in Santa Rosita. Soon, the five bystanders and their riding companions are trying to get to the money first in a wacky comedy about greed. Kramer goes for broke with Ernest Laszlo’s excellent widescreen cinematography (shot on 70 mm no less) that establishes the epic feel of the film, especially the early scenes out in the desert. Kramer, known for his serious dramas, was an odd choice to helm a comedy as his only other forays into the genre were two films he produced that were commercial flops. After making two ultra-serious dramas – On the Beach (1959) and Inherit the Wind (1960) – it’s easy to understand why he wanted to mix things up with Mad World. 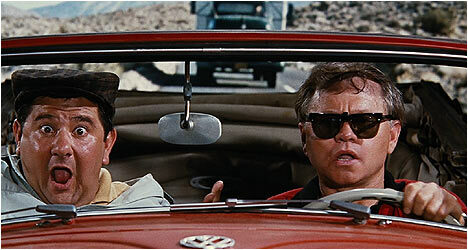 It’s A Mad, Mad, Mad, Mad World is an old school comedy that they just don’t make anymore. It features a stellar cast of legends from a bygone era and gives them opportunities to do their thing and play to their strengths. As a result, the film is an encyclopedia of various comedy styles, from verbal sparring to slapstick. By today’s standards, its humor seems old-fashioned and rightly so as tastes have changed dramatically over the years. For aficionados of classic comedy, Mad World is a prime example of various styles employed by a talented cast that know how to make people laugh. Despite going significantly over budget, Mad World was a huge commercial success, spawning several imitators, chief among them, Spielberg’s 1941 (1979) and Hal Needham’s The Cannonball Run (1981), but they all live in the shadow of Kramer’s film, which really broke the mold. The transfers for both version of the film are exceptional with the colors vibrant while still retaining their filmic qualities. A lot of work clearly went into restoring It’s A Mad, Mad, Mad, Mad World and fans of this film are in for a real treat. Included is a newly mastered transfer of the 163-minute theatrical version. There are “Promotional Spots” from both the 1963 original release and the 1970 re-release. Also included is a collection of vintage radio and T.V. ads that are intriguing to see how differently films were promoted back then, especially with legendary voiceover artist Stan Freberg in charge of the campaign. “AFI’s 100 Years … 100 Laughs” is an excerpt from this program that polled the best comedies of all-time with the likes of Janeane Garofalo and Charles Grodin, along with some of the film’s cast members, talking about why they regard it so highly. A rare treat for fans is the inclusion of a new digital transfer of a 197-minute version that was reconstructed and restored in an attempt to reassemble the longer, original road-show version, which ran 202 minutes. This version features an audio commentary by fans Mark Evanier, Michael Schlesinger and Paul Scrabo. They kick things off by discussing the film’s origins – the idea to make a star-studded epic comedy. This is an incredibly informative track as the participants explain how the opening credits came to be and dish all kinds of filming anecdotes, including dispelling rumors. This is a must-listen for fans. “Restoration Demonstration” takes us through the challenge of restoring the general release version and reassembling the road-show version. The original elements were in bad shape and it is amazing to see how this film was restored to its original glory. “Telescope” is a two-part 1963 episode of a CBC T.V. show that covered the press junket for Mad World. It provides fascinating insight into how films back then were promoted. There is vintage footage of the premiere at Los Angeles’ Cinerama Dome. “Press Interview, 1963” features director Stanley Kramer and cast members Milton Berle, Sid Caesar, Mickey Rooney, and Jonathan Winters interviewed in a way that allowed local T.V. stations to insert their own interviewers. They banter and speak eloquently about the film. “Stanley Kramer’s Reunion with the Great Comedy Artists of Our Time” is a T.V. talk show that Kramer hosted in 1974 where he interviewed cast members Sid Caesar, Buddy Hackett, and Jonathan Winters. They reminisce about making the film and what it was like working together. “The Last 70 mm Film Festival” is Q&A session after the screening of the film in 2012. Billy Crystal hosts and interviews surviving cast and crew members. After a dry introduction by the festival host, Crystal comes out and tells a funny story. The participants share some of their memories making this film. Finally, there is “Sound and Vision,” featuring visual effects expert Craig Barron and sound designer Ben Burtt as they take a look at the film’s ambitious visual and sound effects. They marvel at its technical merits and how this was unusual for a comedy at that time. This is a very informative featurette.